This recipe for a sweet treat comes from Heart of the Mountains, a cookbook published by the Buncombe County Extension Homemakers in 1987. Cream margarine or butter until light and fluffy. Gradually add sugar, and continue to cream. Blend in vanilla. Add eggs, one at a time, beating well after each addition. In another bowl, sift together flour, baking powder, salt, and cinnamon. Add pecans and raisins, and coat well. Alternating between dry ingredients and sour cream, add both to creamed mixture. Blend well. 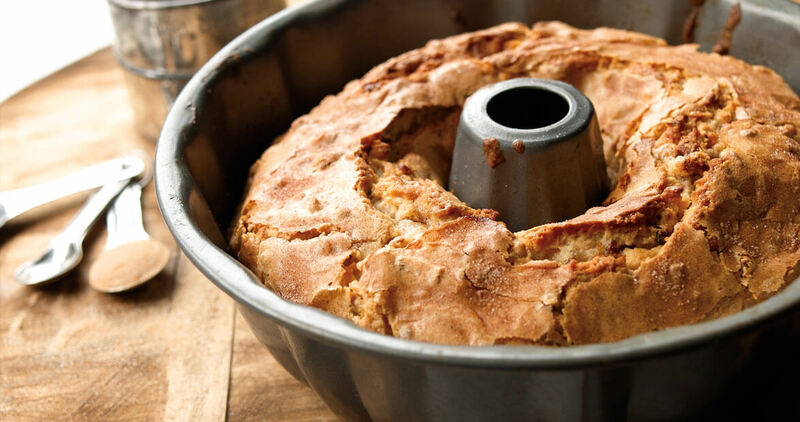 Turn into a greased and floured Bundt or 10-inch tube pan. Sprinkle with cinnamon sugar. Bake at 350° for approximately 1 hour. Leave in pan at least 1 hour before turning out. Turn out, and sprinkle with cinnamon sugar.